This tutorial demonstrates how we can read or import data with a character variable of varying length. We generally encounter this situation when we have company names or both first and last names of a person in our dataset. In the following example, the variable "Name" has varying length i.e. not all observations of this variable has similar length. We can use colon modifier : to tell SAS to read variable "Name" until there is a space or other delimiter. The $30. defines the variable as a character variable having max length 30. The colon modifier is also used to read numeric data that contains special characters such as comma For example 1,000. In the following program, we use a length statement prior to input statement to adjust varying length of a variable. In this case, the variable Name would be read first. Use only $ instead of $30. after "Name" in INPUT statement. It changes the order of variables as the variable Name would be read first. We can use ampersand (&) to tell SAS to read the variable until there are two or more spaces as a delimeter. This technique is very useful when the variable contains two or more words. For example, if we have observation like "Deepanshu Bhalla" rather than "DeepanshuBhalla". In this case, we have a space between First Name and Last Name and we want to store both the first and last names in a single variable. In this case, the following methods do not work. LENGTH Statement prior to INPUT Statement does not work here. Use Ampersand (&) and add ADDITIONAL space works. This trick works in reading data from external file. 28 Responses to "SAS : Read Character Variable of Varying Length"
this code is giving error could you please tell me why? Please use below code. It should work. Just don't forget to put 2 spaces before numbers 20, 23, 19, 21.
please suggest the sas programme to get this output. 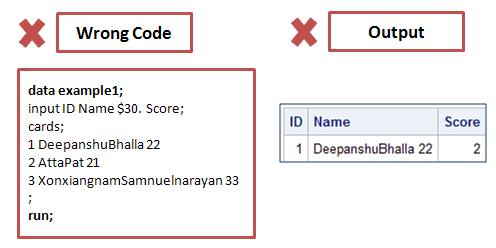 Hi Shilpi, Can you please assist in explaining the use of name=e in the fourth step of the above code. In Example 1 where there are no spaces between first and last name, we can also use truncover to avoid the problem of SAS reading next variable when the variable length is less than passed in input statement. Correct me if I am wrong. After importing the excel file to SAS, how to view the data set ? Is there is any other step involved before importing the data like, assign a name to the data or anything like that ? please provide clarification regarding this.